High Strangeness: Swamp Gas Fever! 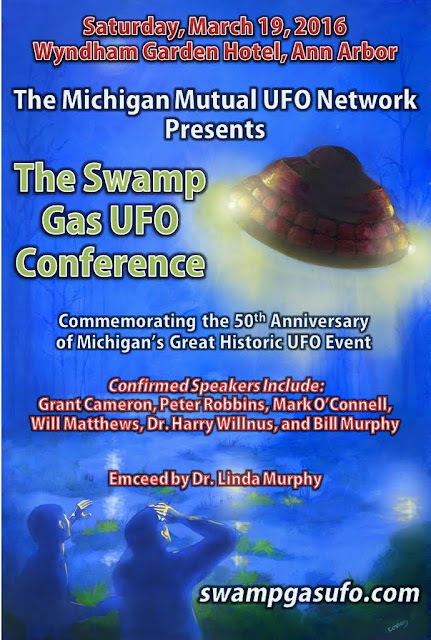 I've just gotten updates about the two big speaking engagements I have lined up for 2016: the Great Roswell Debate, in which I will face off against Roswell brainiac Donald Schmitt to debate something or other about the Roswell saucer crash mystery; and the Swamp Gas UFO Conference, commemorating the 50th anniversary of the still-controversial Dexter-Hillsdale, Michigan, UFO sightings of 1966. First off, the gentleman who is putting on the debate informs me that the big event will take place at the Milwaukee Paranormal Conference, next October 15-16. It will probably be the prime-time event that Saturday, but the schedule is not set in stone at this point. "I spoke to someone from Marquette University's Debate Team, and he said he'd be glad to sit down and talk with me about running a debate effectively, giving me an overview on formats and such. I also got leads on people versed in debate that might make a good team to help run the event." This is pretty exciting to me. I'm thrilled that the folks at Michigan MUFON are putting on this event, and I am tickled to death that I get to take part. I am sad to say, however, that the administration of Hillsdale College has declined to host any portion of the event or be involved in any way. Do you suppose the administrators were worried about the College's image? That seems to be the likely explanation, and if it's true then I think they made a bad choice, for their College, for their students, and for their community. What do you think? If you could make it to Ann Arbor in March, what would you like to hear me babble about? I vote for: "I can talk about why the American public were especially primed for a spectacular UFO event in March, 1966". Is "emceed" now officially recognised (Australian spelling) as a real word? As usual, PG is right. I too vote for #1. I don't know how such things are organised, but I would hope that whoever is overseeing the speakers would help you all work this out well ahead of time.